'The time has come for our European partners to stop undermining U.S. sanctions against this murderous, revolutionary regime. The time has come for our European partners to withdraw from the Iran nuclear deal,' Pence told delegates. 'Once more the Old World can take a strong stand in support of freedom in the New World. Today we call on the European Union to step forward for freedom and recognize Juan Guaido as the only legitimate president of Venezuela,' Pence said. 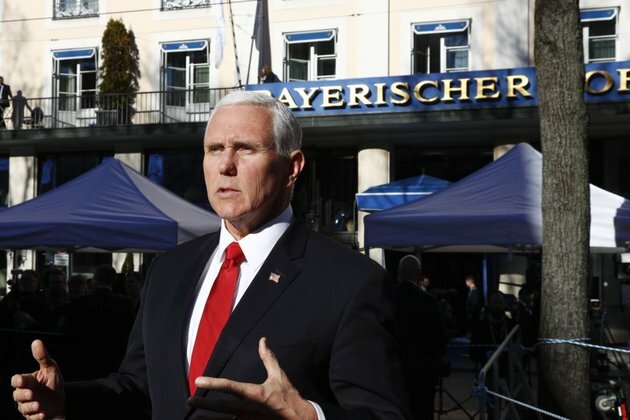 Pence repeated Washington's calls for European NATO allies to do more to meet their military spending targets and cautioned against developing economic links with Moscow, such as the Nord Stream 2 gas pipeline currently under construction between Russia and Germany. 'We cannot ensure the defense of the West if our allies grow dependent on the East,' Pence said. 'At a time when the Europeans allowed to draw themselves into a senseless standoff with Russia and incurred multi-billion-dollar losses from the sanctions pushed for from overseas, the world is rapidly changing. Actually, the EU has lost its monopoly on the regional integration agenda,' Lavrov said. 'Our world stands at a crossroads and faces a consequential choice between unilateralism and multilateralism, conflict and dialogue, isolation and openness,' Yang Jiechi, a senior member of the politburo and a former Chinese ambassador to the U.S., told delegates. The Munich Security Conference is seen as a key annual forum for world leaders to discuss global security concerns and conflicts both in public and in private in dozens of closed-door meetings taking place inside the venue. 'There is still a lot of grief over the old order being gone where everything was much more predictable, or at least appeared to be more predictable. So that's slowly setting in,' said Gaub.